MOUNT MITCHELL IS A FAVORITE PLACE TO THE LOCALS AND TO THE VISITORS, TO EXPERIENCED HIKERS AND FOR NON-HIKERS. THEY ALL COME TO ENJOY THE BREATHTAKING VIEWS FROM THE TOP. THIS BEAUTY STANDS PROUDLY AS THE HIGHEST IN EASTERN NORTH AMERICA. Mount Mitchell is a tall mountain in North Carolina, in the Appalachians, in the heart of the Black Mountains. 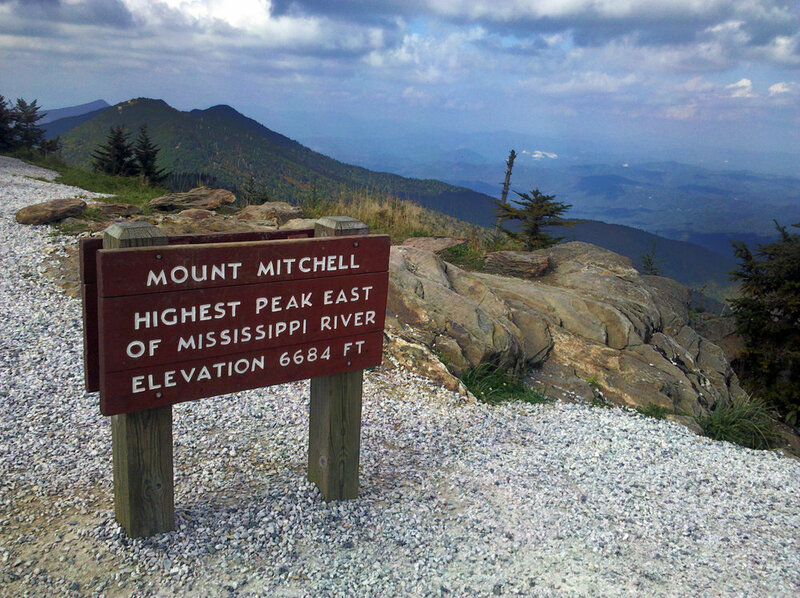 More than a mile high, Mount Mitchell is the highest peak east of the Mississippi River. It is also the tallest point of eastern North America. Mount Mitchell is the star of Mount Mitchell State Park. The mountain is known to have many weather changes in one day. Rain, sun, shadows and clouds are changing rapidly on Mount Mitchell. Hikers say that if you don’t like the weather, just walk 15 feet and it will change. The Black Mountains got their name because of the dark firs and spruces covering the slopes. The mountains carry more than 20 peaks that are higher than 6000 ft, making them the tallest range in the Appalachians. Mount Mitchell was named after Elisha Mitchell, who was exploring the Black Mountains and their height with the use of the barometer. Studies were held in the mid-1830s. Mitchell has determined a height of 6,672 feet, which is only 12 feet less than the actual height of the mountain. Former student of Dr Mitchell and a congressman at that time, Thomas Clingman, had doubts about the accuracy of professor's measurements. This started a long discussion between these two explorers on who correctly measured the mountain. In 1857, in order to confirm his measurements, the professor decided to return to the mountain. Before he reached the destination, he fell and died in a place that is now known as Mitchell's Falls. After this accident, Clingman agreed that the mountain should be named after Elisha Mitchell. Clingmans Dome is named after Thomas Clingman. At the beginning of the 20th century, there were several logging companies on the mountain, such as Carolina Spruce, Dickey and Campbell, Brown Bothers and the largest Perley and Crockett. In this period the Black Mountains were left without the majority of trees. The trees were transported to Pensacola by rail. The railroad was very narrow. This industry has been replaced by the state park, thanks to John Silcox Holmes. Holmes State Forest was later named after him. The logging has stopped only when Holmes became governor in 1913. His work contributed to the state of NC adopting a bill to make a park on Mount Mitchell. This happened on March 3, 1915, and this was probably the first state park in the Southeast of the United States. In 1940, public road was finished and people of North Carolina finally got access to the highest peak in the state. Eight years after that, the states Highway 128 was completed and tourists also got the new road and the chance to travel and visit this mountain. After the Blue Ridge Parkway was done in 1950, Mount Mitchell welcomed over 200,000 visitors. Mount Mitchell is located in the Black Mountains of North Carolina. It's the highest mountain in eastern North America - the highest peak east of the Mississippi River. Burnsville, in Yancey County of North Carolina is near Mount Mitchell. The mountain is about 20 miles far from Asheville. Blue Ridge Parkway connects Mount Mitchell to Clingmans Dome, the third tallest peak east of Mississippi. Mount Mitchell is a proud part of the Black Mountain Crest. Black Mountains also carry the second tallest peak east of Mississippi, which is Mount Craig. The summit is high in the Mitchell State Park. The mountain is also protected by its State Park and the Pisgah National Forest is surrounding it. Many trails start in the Pisgah National Forest, including Mount Mitchell Trail. The nearest high peaks are in South Dakota, on the Black Hills. The mountain has many New England plants like oxalis, hobblebush mountain wood sorrel, yellow birch and mountain ash. Of course, you can also find evergreen Fraser fir and red spruce. While you hike higher, you enter an oak hardwood forest. In the summer, wildflowers are in bloom. Fir and spruce trees are doing well in this climate, and birds feed on their pine cones. There are also wild blueberry and blackberry shrubs. There are at leat 91 bird species in the park as the bird watchers have observed. Some of them are red-breasted nuthatch, winter wrens, slate-colored juncos, golden-crowned kinglets, brown creepers and red crossbills. There is an observation tower for visitors from where the peregrine falcons are seen. Sometimes you can spot the saw-whet owl. In the summer, Ruffed grouse can be found, and monarch butterflies and hawks are there in the fall. Black bears are found to be active in this area. It is not uncommon to run into a bear at Mount Mitchell State Park, especially in the summer. Many historians believe that Andre Michaux was first to climb Mount Mitchell in 1789. He was a French scientist and botanist. 1787 Michaux was researching the most important plants in the Black Mountain region. On his excursions in this area, Andre Michaux has found more than 2500 specimens of bushes, trees and many other plants. Michaux was elected Royal Botanist by French King Louis XVI whosent him to investigate plants in America that he would consider to be of great value. At the time of the French Revolution, the value of new and untapped plants was unknown and potentially quite large, especially in dense, sumptuous mountains in America. Michaux also climbed the Grandfather Mountain. He declared it as the tallest peak in the Appalachians, but he surely made a mistake. About the same time, another botanist that came to investigate this area was John Fraser from England. Fraser firs are named after him. They are the most abundant along the ridge of black mountain and naturally grow in this region. For the outdoor lovers, this spectacular mountain offers a great number of activities. Depending on what you are looking for, you can choose hiking, bird watching, camping, and many other activities. There is a tent-only camp area for families. The difficulty and the length of the hike will depend on your fitness level and on your experience. The hike can be done in a day, that is doable for anybody regardless of their physical condition. Some people like to make the hike into a 2 day trip, and choose to spend the night on the top. The trail is rough in some sections, by the view that you will get in the end are worth it. At the lower elevation, your journey will be through a mixed hardwood forest. As you go up, old and thick spruce forests take over. Fraser Fir is located near the top. There is another trail that leads to Higgins Bald, but that one is a bit longer. This trail is also called Black Mountains Crest Trail. The trail is very difficult, it extends across four peaks above 6000 ft, including the second tallest eastern mountain, Mt. Craig. Also, there are Cattail Peak, Potato Hill and Big Tom. After that, the trail is coming down to Deep Gap, a very popular site of the National Forest campsite. The views are rewarding, making the steep and rocky trail seem not that hard. The whole trail is at 6000 feet and above. It gives a beautiful and unforgettable view of the summit and the mountains. Hikers will come across some sharp cliff areas. There are also restaurants and campgrounds along the way. A simple, unchallenging hike on the road to the historic camp site, where the logging companies were. The trail leads trough grassy areas on Bearwallow and Grassy Knob Ridges. The views of Mount Mitchell are amazing. It connects to different trails like Camp Alice Trail and Mountains to Sea Trail. As you guessed it, the trail starts at Camp Alice. A short trail, but rough and sharp. It takes you through wonderful areas of Fraser fir forests. The trail goes through a dense fir forest. It is a loop hike, short and simple. Let the nature guide you to the summit trough one of a kind boreal forest. Summit Trail leads straight to the summit and to the observation area. A short 0.1 mile walk.